Sleep well. You’re all safe. I’m also using Amplifi HD but I replaced my airport router. I use three antennas and every part of the house has a strong WiFi signal now. Just update the router to the amber light turns green again. Glad to find this thread. I’ve got a 3rd generation Airport Extreme, over 9 years old, never crashed, and was a refurb! Probably time to replace it to get 802.11ac and other improvements. I only need a Wireless Access Port, can’t use the router function. Probably don’t need mesh as the AE works fine at the router’s location dead center in our 2200 sq ft house. Generally bad experience with consumer grade networking equipment in the past so am considering Ubiquiti UniFi UAP-AC-LR. If I do need to extend, I’ve got wired Ethernet at two opposite extremes in the house, but I expect that just one centrally located will work. At about $100 it’s hard to imagine going wrong, but is there anyone here wiling to dissuade me from it and point me to something else? So you do have a good router right? Otherwise you are on the right track. Router works fine and is supplied by ISP. But the built-in WAP was lousy so bought the Airport Extreme, which runs in bridge mode. Want a replacement that works great in bridge mode or is just a WAP. Thinking back, I’ve had wireless at home since 2002 and have always had separate router and WAP. How many floors? If your house is a single-floor, ranch-style house, the signal may be marginal near the ends of the house if you have only 1 AP in the center. It really depends on the internal wall placement and materials. Rather than having 1 central AP, you might have better results by getting 2 or more UAP-AC-LITE’s and distribute them around the house near where Wifi is most used. My advise is to replace the ISP router / moden combo with a decicated modem and or put it in bridge mode. If it doesnt do this by itself turn off the WiFi in the ISP provided modem. Use your own router. If you need a Mesh Network go with Google or Eero. One floor. Worst case location (signal down about 20 dB from best location) is through two walls and a fireplace, but it also has a hardwire connection where I could add another WAP. Second worst location is through two exterior walls (L shaped house) and a couple of interior walls. There is a hardwire connection there as well. So I could go with two WAPs or three with one centrally located if just one won’t do. I’ll experiment with just one first. Also see my next post. I’ve got FiOS service and what would be the modem (called an ONT) is at the far corner of the house (in the garage) with the router centrally located. The ISP needs the router to diagnose problems going outward from the router, so I’m not anxious to replace it. If I did I’d also have to buy another MOCA/Ethernet adapter at about $80. The router is also their equipment (not mine) and works just fine as a router. 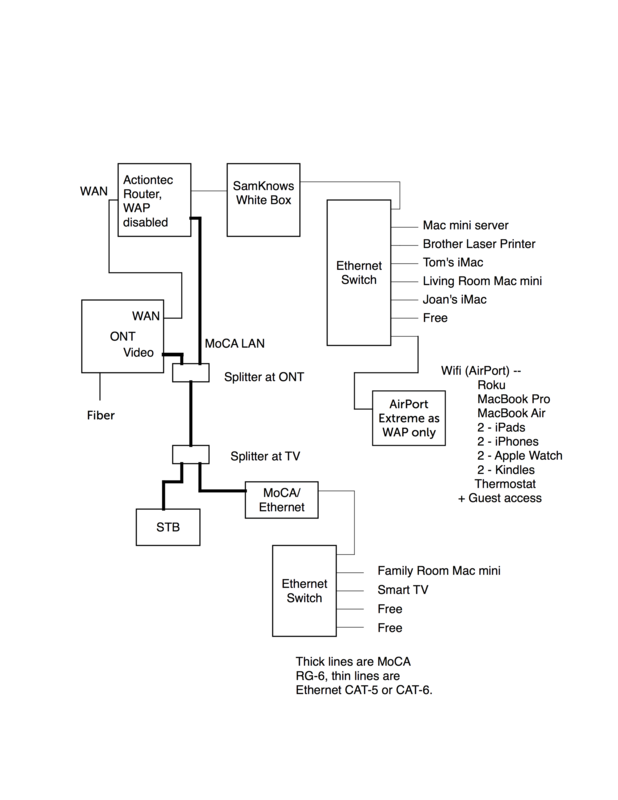 There is also MoCA from the LAN side of the router back to the ONT where the data is merged with video, goes to the TV STB at one side of the house (behind the fireplace mentioned in my previous post) where a MoCA/Ethernet adapter gives me wired Ethernet for the TV and a Mac mini. All the networking gear shown below is in the central room but for the components mentioned at the TV or garage. Replacing the Airport Extreme with another WAP (like the Ubiquiti Unifi) should be fast and easy. But I can also install them at corners of the house at the TV (fed through the MoCA) and my wife’s iMac in the opposite by adding an Ethernet switch. Last year I was mindful of the advanced age of my airport extreme (gen 1) and aware of a few WiFi black spots in the house. I researched a replacement for my old airport extreme and 2 airport express. I settled on a pair of Netgear Orbi 3000 after much reading of reviews. The network set up beautifully without much fiddling. However over the next few days it constantly dropped connections, disconnected devices and was generally frustrating. I returned it and bought a new airport extreme, and recycled the old one into the network. Since then no problems at all. I’m sad that it has been discontinued (only a few months after I bought it) and hope that it goes on as long as its predecessor. I particularly like how easy it is to check on the network through Airport utility. So I picked up a Ubiquiti UniFi AP AC LR and ran it in parallel with my 2009 AirPort Extreme for testing. 10dB better signal in the low band everywhere (rated as “good” by sniffing software) and no dead spots. High band was only slightly stronger. But it looks fine with only one AP. The nerd in me would want to have a whole network of them, but I’ll pass for now. Since I have a 24/7 server, running the UniFi Controller app is a non-issue. I like the controller app much more than the AirPort. Only thing I don’t like is having to deal with the PoE adapter clutter, but realize that it would be nice for a “real” installation. Now I need to mount it on the ceiling, but the AirPort Extreme is turned off. The WiFI AP might loud and clear but can it hear weak signals from smartphones, tablets and iot devices? There is a constant back and forth between the network devices. For example, loading a web page is a big stack of smaller pieces of data each of them has to be confirmed by the recipient. The WiFi AP will keep repeating the last package before sending a new one until it has received confirmation. When it has trouble hearing the weak signal it will significantly slow down the user experience. Scan the WiFi spectrum close the WiFi AP to make sure there isn’t much interference to increase the Signal To Noise radio (SN) of the weak devices. It’s often better to have multiple WiFi AP’s with low power than one big one. This is where in the consumer world the “Mesh” devices have an big advantage assuming they are setup right. I don’t think I’ve got a problem with being too powerful. Even in the worst case locations in the house I get my full 50/50 Internet speed. The back of our back yard does 40/50 (up is faster) and at the street in front it’s 25/30, but this is fine as I don’t really want to transmit through the neighborhood. The UniFi AP sees 22 distinct neighbor APs on the same channels which, frankly, in a 1/4 acre lot suburban community seems ridiculously high. No competition in the high band, just the low. I do know that my transmit retry rate is 2.1%, but I don’t know the goodness/badness of that figure. I still have the option to add one or two additional APs at the extremes of the house, for which I could certainly just get the “Lite” models and reduce the power as well. Hi everyone, this is my first entry in this forum. I have listened to MPU for many years, but I am decidedly NOT a power user. I first heard of a mesh network from an MPU show some time this year and realized it could solve 2 problems. I installed a Ring doorbell (close to my router) and a Floodlight Cam over my garage (far away from router and 2 brick walls between). My wireless signal was insufficient to reliably use the floodlight, so I added a Ring Chime Pro to boost the signal. It works most of the time but is slow. My signal in the kitchen has been compromised by a large refrigerator I bought. Will the Eero indeed solve my problem? Can I use the Eero and still use Airport for backup without extensive configuration (remember - I am not a techie but can get by)? The reason I even use Apple is because I can always call them for troubleshooting and configuration. If Airport won’t work, what is the best/easiest solution for backup? I would be so appreciative of any help. An Eero system will probably help with your reception problems (hard to know for sure without knowing your house’s exact layout and construction). Do you have an AirPort or a Time Capsule? I ask because you mention using it for backup. If you have a Time Capsule you can use it for backup while using the Eero as a router and for WiFi access. I purchased an eero earlier this year and have been very happy with it. The eero is exceptionally easy to set up. In fact it’s one of the best first impressions I’ve had of a new product. 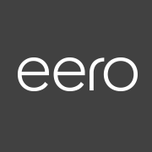 The eero network is managed through their beautiful iPhone app that provides a wide range of features while still being very easy to use. I’ve been using a 1st gen eero for two years (as of yesterday). Rock solid performance with IOS, macOS, & android, It is updated automatically, so basic security should be excellent. And you can manage it from anywhere from your iPhone. I opted for eero+ which adds additional security, filters, ad-block, etc. The $99/year cost is offset, for me, by the included 1password family plan, encrypt.me VPN, and Malwarebytes software. I was already paying $36/year for 1password alone. Thank you for the clarification - yes, it is Time Capsule, and I have both configured for backup (belt-and-suspenders). I appreciate the link and will be putting it to use!